To celebrate both the end of NATCROMO (National Crochet Month) and Knit and Crochet Blog Week, I am posting my long worked on and much more difficult than I thought it would be Hooked Holla Infinity Scarf. Inspired by the knit Challah Infinity Scarf, this pattern was a lot of fun and very challenging to create. I think the results are stunning, so expect a few more variations in the future. 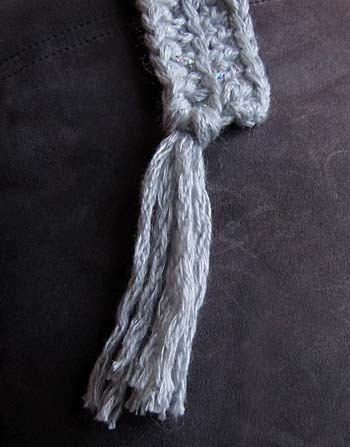 You will be making two ribbed strands and one textured strand, then braiding them together, sewing together the ends and sewing together the strands in two additional places to keep the braid even. 500 yards worsted weight yarn (I used 3 skeins of Stitch Nation’s Bamboo Ewe, 2 in Mermaid and 1 in Beach Glass). You can use one, two, or three colors, your choice. 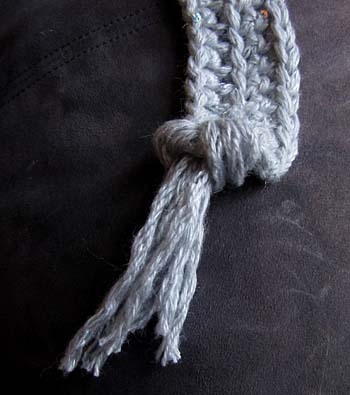 FPhdtc (Front Post Half Double Triple Crochet): YO 3x, insert hook through front post of stitch, (YO, pull up a loop, YO, pull through 2 loops) 2x, YO, pull up a loop, YO, pull through all loops on hook. FFLO (Front Front Loops Only): when you look at the top of the HDC, instead of the usual 2 loops, you see 3. You will only be working in the the loop closest to you, the front front loop. You have two options for the ribbed strands, either with or without the reversible post stitches to create segments in the scarf. While it was a fun and challenging stitch for me to come up with, I could take it or leave it in the final scarf, so I give you the choice. If you are a beginner, go with Option 2, it’s a lot easier. The reversible post is created using front post stitches on each row, hooking into the post stitch and continuing from the row below, then ending with a back-front post stitch, and a finishing row of slip stitches. Special Stitch, Back-Front Post stitch (B-FPhdtc): Yo, insert hook through post of back post stitch, YO, pull up a loop, YO, pull through 2 loops, YO 3x, insert hook through post of front post stitch, (YO, pull up a loop, YO, pull through 2 loops) 2x, YO, pull through all loops on hook. FO leaving a long tail to later sew the ends of the scarf together. This uses kind of a Griddle stitch and Bead stitch variation. 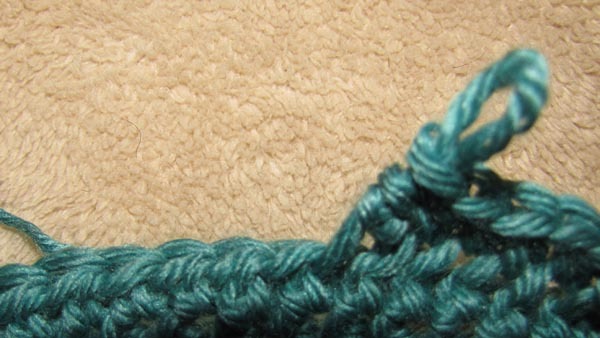 Since this strand is not as dense as the Ribbed Strands, I found using less stitches produced the correct length. Row 4: Turn, Ch 1, (SC, TC, SC, DC) repeat across. Lay all three strands flat. 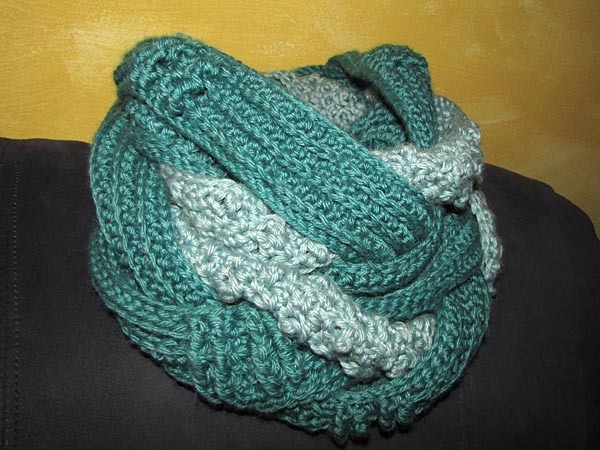 Sew the ends together to turn this into an infinity scarf. 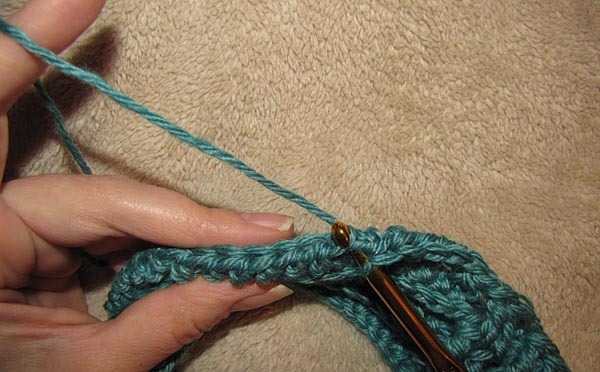 At thirds, sew the scarf at two additional points to keep your braid even. Hooked Holla Infinity Scarf Almost Done! So I have not been ignoring my crocheting, but there has been a lot going on. Last week I ended my old job and this week I started a great new one. At the same time, I’ve been working on some new designs and in some cases, they’ve been taking a lot longer to work out than expected. I just finished the crochet for the Hooked Holla Infinity Scarf and I am super excited to be in the home stretch of assembly. I am still hoping to have the pattern posted by the end of the month, probably this weekend. 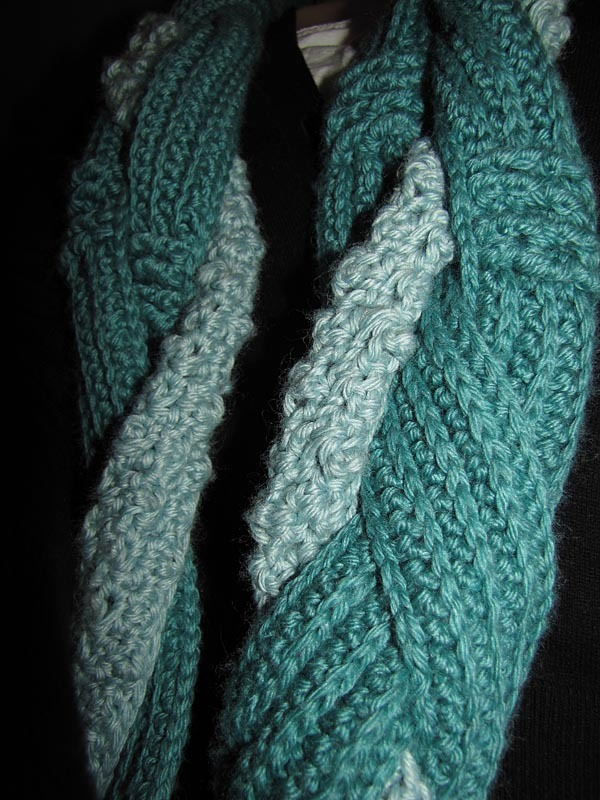 I’ve been mulling the design of this scarf over in my head for a while now. I loved the Challah Infinity Scarf since I first came across the pattern on Ravelry, but alas, it is a knit pattern and I don’t do that. While I was tempted to purchase the knit pattern to see if I could just make a crocheted translation, the $7 price tag got me to get creative instead. I was very inspired by the Challah Infinity Scarf and decided to make the Hooked Holla Infinity Scarf. Since it is a little knockoffy I chose to keep the pattern free, even after extensive reworking. 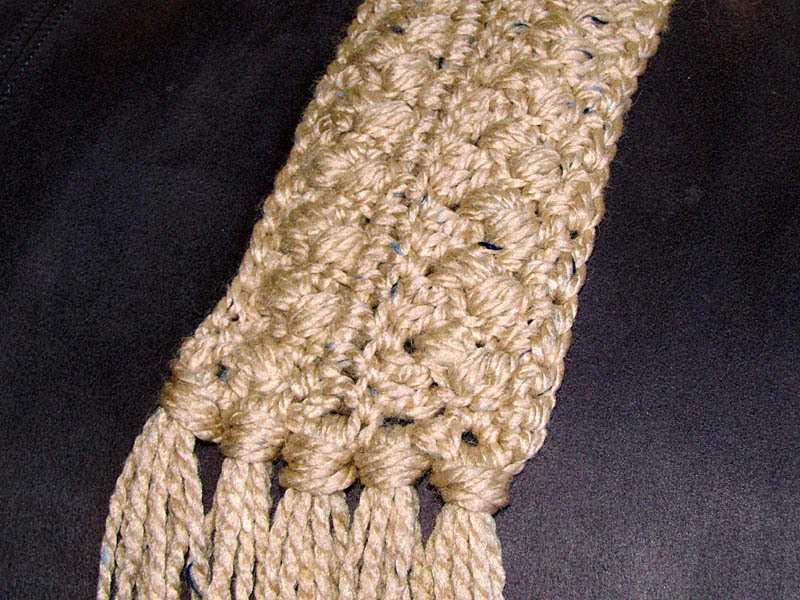 It’s two ribbed strands with reversible post stitches between segments and one textured strand made of a griddle stitch variation. 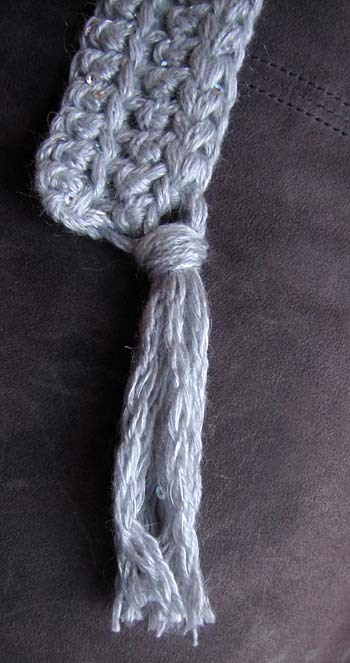 I worked the textured strand so many times I lost count. It was a long time before I was happy with the way the texture looked and worked with the ribbed strands. 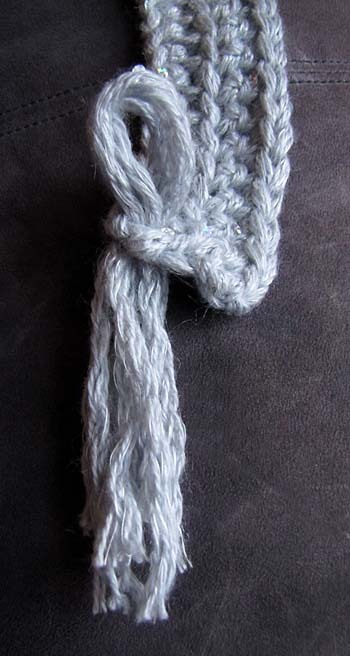 So after you make these three strands, you braid them together and sew the ends together to make it continuous. That’s the part I’m about to do (with fingers crossed). 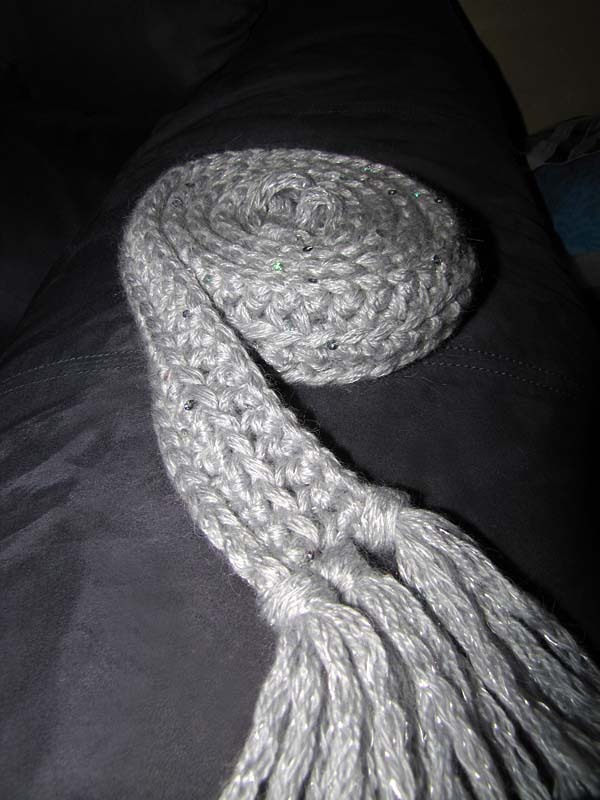 After a lot of work and reworking, I hope this becomes the amazing scarf I know the Hooked Holla was meant to be. After eyeing it several times when I was in foreign Michael’s stores (aka the far ones that I don’t usually go to), I bought a skein of Dewdrops in Diamond over the weekend thinking it would work with a scarf pattern I’d been meaning to try. I tried it and it didn’t. It is gorgeous yarn though and I was on a mission to turn it into a scarf so this is the story of 1 hour + 1 skein and how it became 1 Spectacularly Sparkly Scarf. 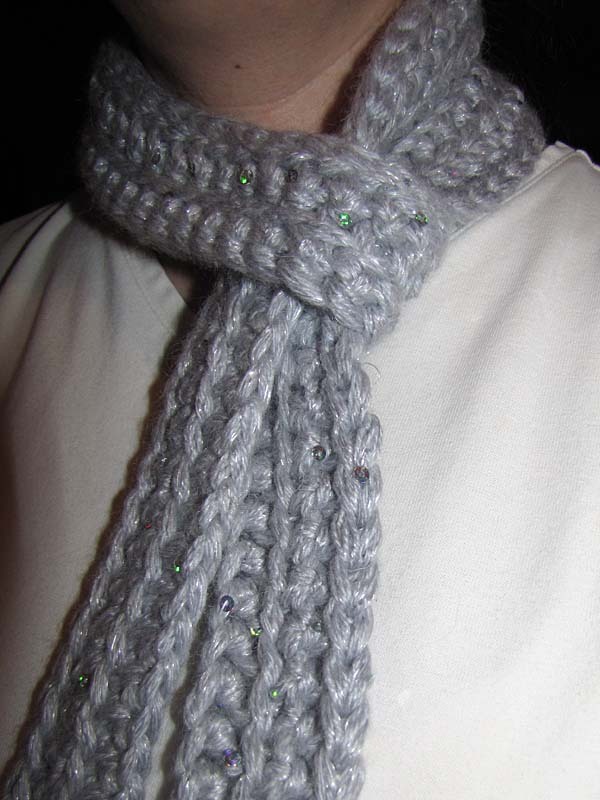 You can use a different yarn, but if you go with a plain, solid color with no sparkle, it will result in a very basic scarf that I would call a Super Simple Scarf. 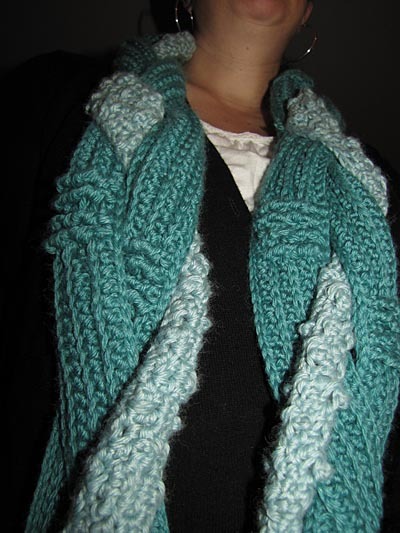 At least use different colors for each row to add some interest to make a Simply Striped Scarf. Dewdrops is not as heavy as Lion Brand Wool-Ease Thick & Quick, so you could probably use a thicker Bulky yarn instead of Super Bulky if you’re subbing. With remaining yarn, cut 18 strands 12 inches each. This will become your fringe. Add 3 3 strand fringes per side. Instead of weaving in your ends, you can just tie them into your fringe. I’ll be tucking this scarf away and giving it as a Christmas present for Christmas 2011. 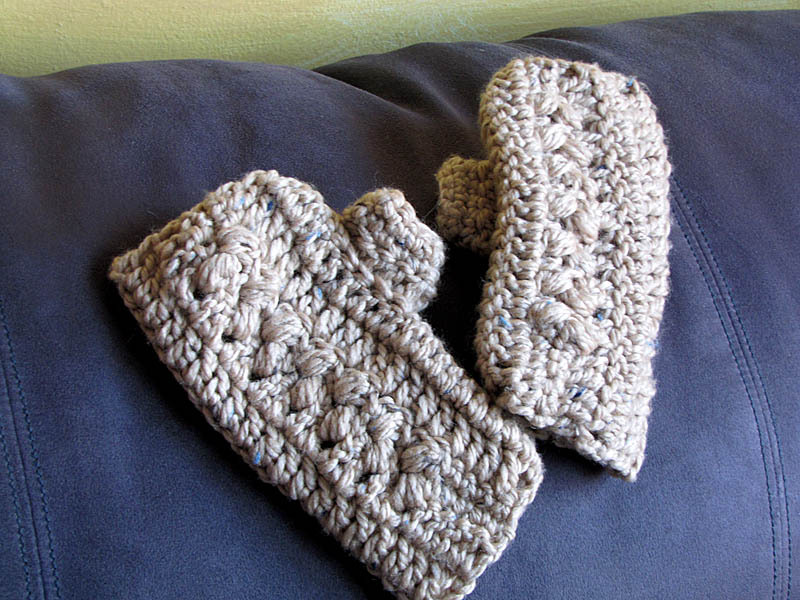 The sparkle in the yarn makes this a fun gift. 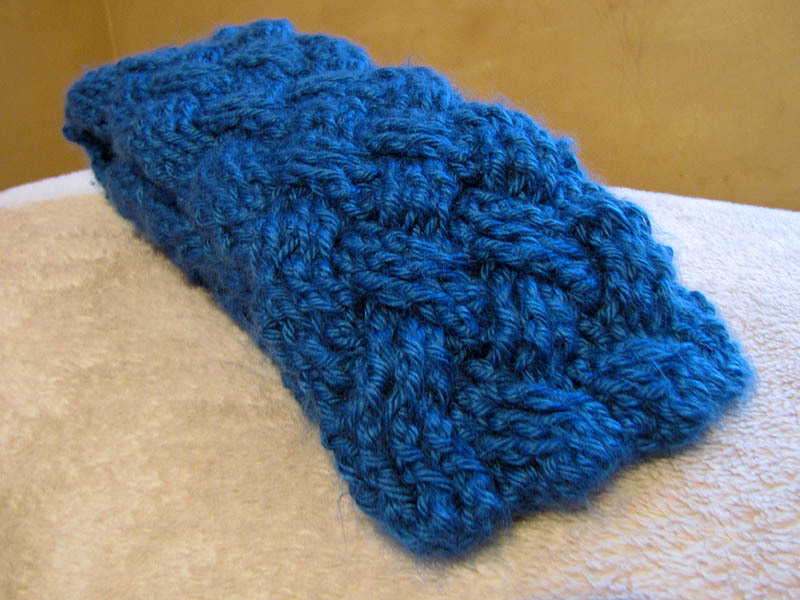 This scarf looks great folded in half with the end threaded through and works as an indoor or outdoor accessory. It can also be worn as a belt. 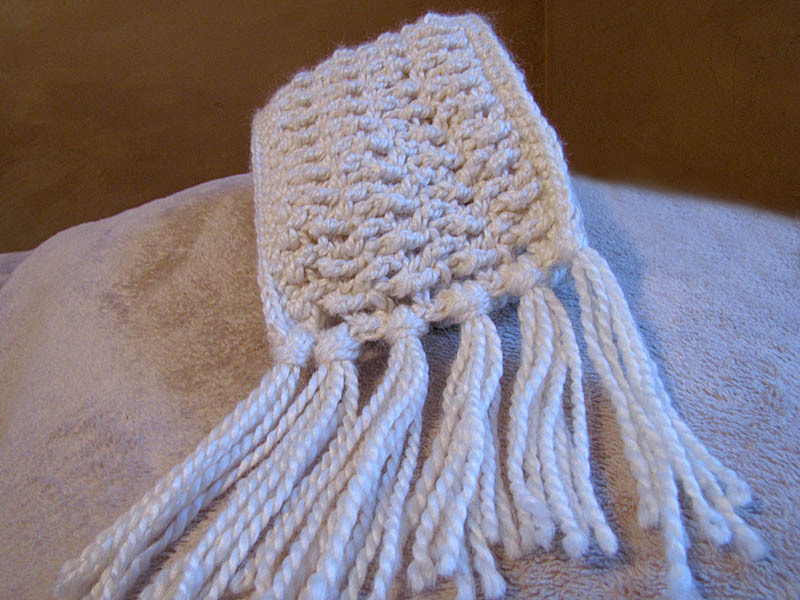 For a bulky or super bulky yarn, you usually use 3-4 strands per fringe. Cut lengths of 10-14 inches (depending on how long you want your fringe and how much yarn you have left). Take 3-4 strands and fold them in half. 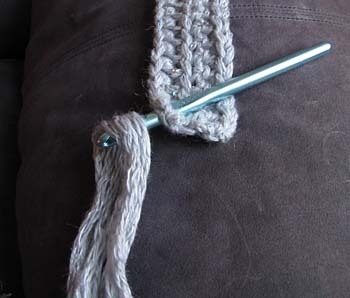 Pull the folded part through where you want to add it to the scarf. 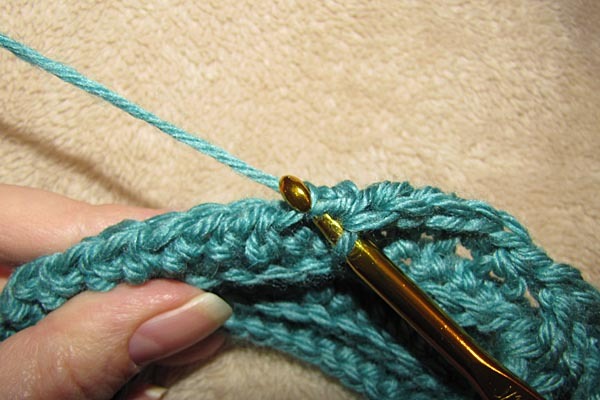 Thread the loose strands through the folded part and pull it tight. TA DA! You have added a fringe. 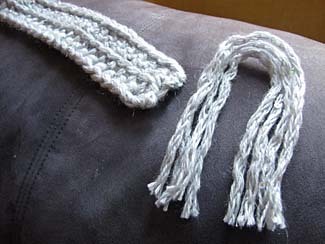 How many fringes you add per side depends on how much yarn you have and how wide your scarf is. To add length to any scarf without adding more stitches, just add a fringe. 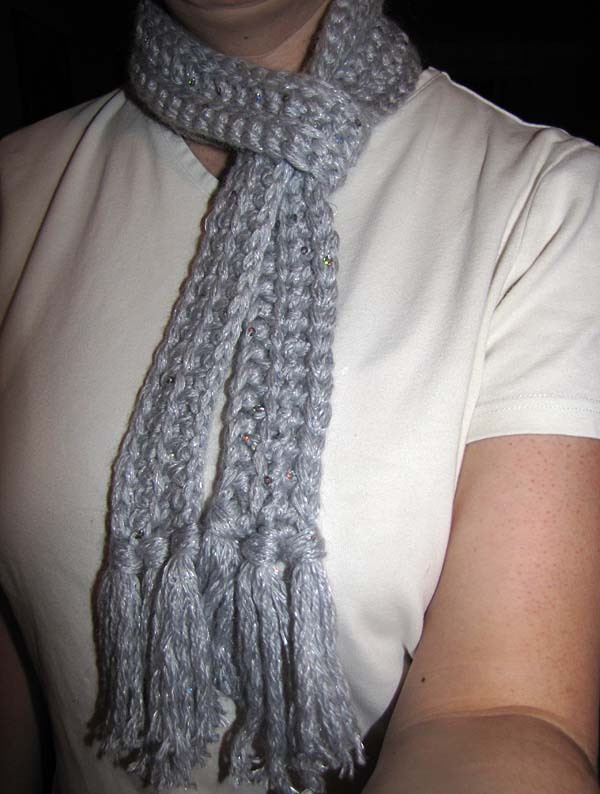 It can add a few more inches to make your scarf just the right length instead of a little too short. Not sure if it was weather, an unheated office, or my crochet addiction, but this year I have discovered an object that the rest of the world has known about for a long time… the scarf. It started with one for my husband and branched into a bunch for Christmas presents, but I’ve never been a scarf person and I can’t remember the last time I owned one. Now it’s starting to get a little out of control. You put them around your neck and they keep you warm, who knew? 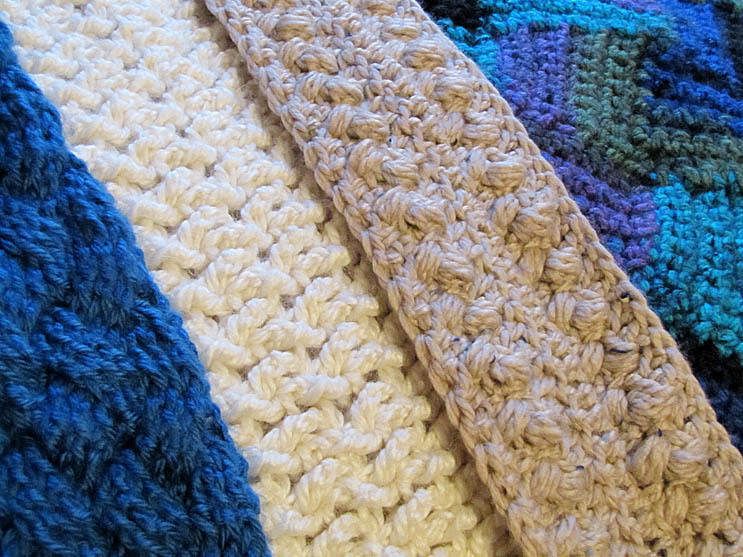 Many can be made in one night and they’re crochet instant gratification! Scarves are my favorite object of the month (as opposed to sweaters which are just my eternal UFOs). I’ve improved my crochet skills greatly since I picked up Amigurmi World back in August and made my first amigurmi. Recently, I’ve been seeking out more and more challenging patterns which has led me to what started as woven scarf week and has turned into woven scarf month. I think I’m stopping at 4 woven looking scarves for the season. There’s a limit to how many scarves you can wear at one time and I think I’m reaching excessive levels. My favorite of them all is a textured woven looking pattern made of post stitches. This one was done with Bernat’s Alpaca Natural Blends and I fell in love with Alpaca while making it. When it was done I almost cried as it broke my heart. It was itchy as hell. Regardless, it’s still my favorite of the four and I will attempt to wear it… until I can’t take the scratchyness anymore or I my skin starts turning red. Pattern designed by Jenny Collins. Available as a Ravelry download and on Etsy through her SpottyOwlStudio Etsy store. This woven scarf is truly a woven scarf. It’s very thick as a result and is also made of post stitches. It takes a while to work up. Take note of the “behind the stitches” line in the pattern. If you don’t work “behind” you will end up with diagonal lines that do not look woven, which is what I had going on for a while before I contacted the designer and started over. Sometimes the shorter the pattern, the less attention I pay to what it actually says. Bad idea. 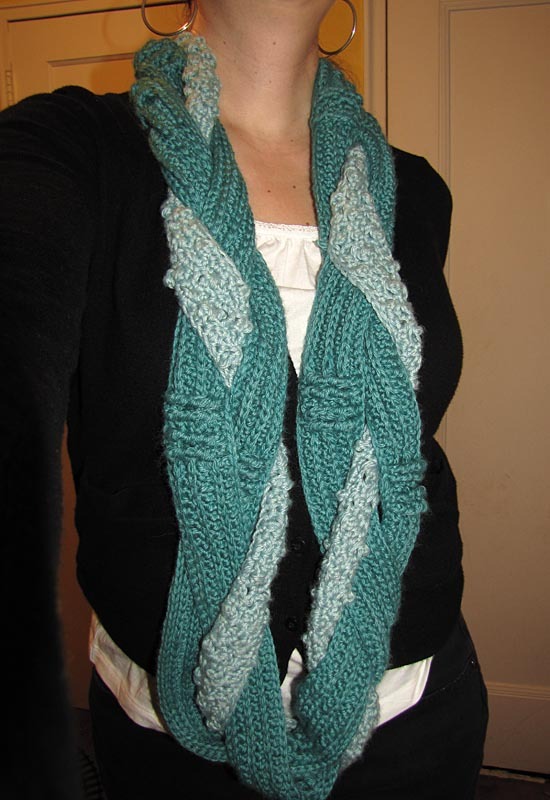 This was a fun scarf at first, but after a while, I just wanted it done. It was a very interesting pattern and fun to see how it was done. Pattern designed by Amy Anguish. Available on Etsy at the Beads and Lace by Amy Etsy store. 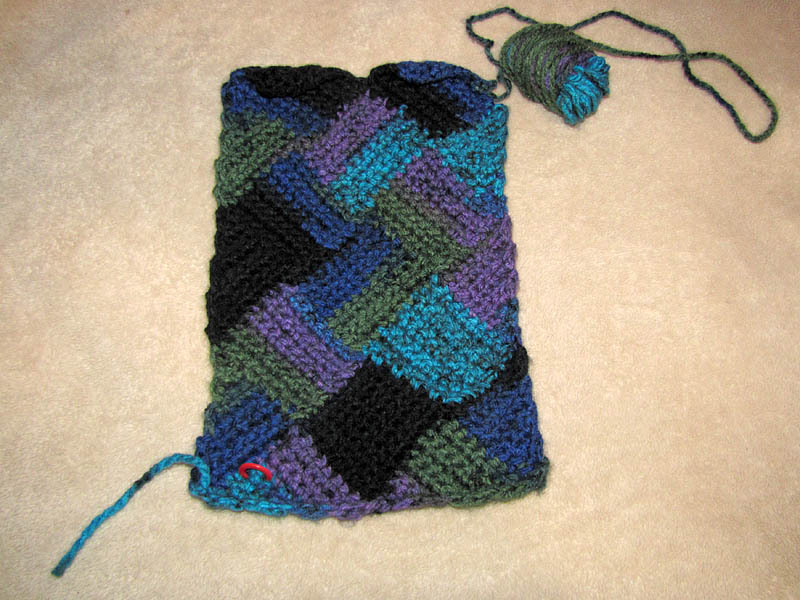 This entrelac crochet scarf has also been a very enlightening project and fun to see how it works up. It’s a great way to learn the technique and I plan on making some notebook covers based on this pattern. Unfortunately, it’s been taking a lot more yarn than I expected and Michael’s has been out of this color or Charisma, so it will be a while before it’s done. For some reason, my son has decided to claim this scarf as his. I think he likes the colors. Pattern designed by Joyce Renee Wyatt. Available in the AMAZING and inspiring book Crochet Master Class. Then there’s the Final Woven Scarf of the Season. Not my favorite of all of the patterns, but I have a feeling I’ll be wearing this scarf almost every day. The pattern confused the hell out of me and my “translation” can be found on Ravelry. Thanks to gerrijo on Ravelry who tackled this scarf way before my attempt. I never would have figured this out if I hadn’t read your comments. Pattern designed by Julia Redman. Available for free on her blog. This scarf did grow on me throughout the day and by the time I was done I was inspired to create matching fingerless gloves (pattern to be posted later this week). You never know when inspiration will strike. 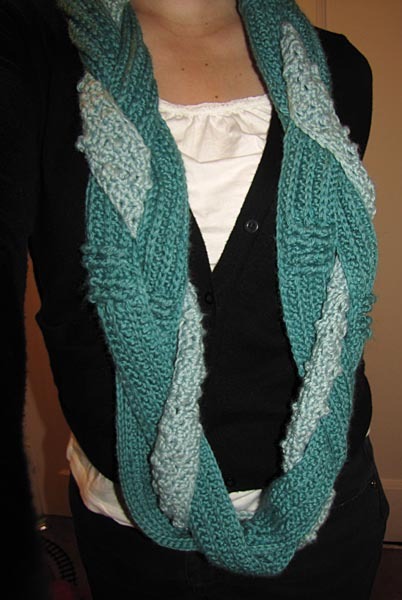 I am officially putting down the hook and walking away from the woven scarves… at least until next year.